One of the nicest things about becoming a ‘grown up’ is the ability to enjoy alcohol in recipes, and these two decadent suggestions will make any dinner party a talking point for months to come. Chocolate and orange are a classic combination and added to this vodka martini they produce a zesty treat. The good thing about this cocktail is that the preparation can be done well in advance so that your guests arrive to a deliciously different drink without you having to break off from kitchen duties for more than a couple of minutes. You can choose from Cointreau or Grand Mariner for the liqueur or even some of the generic ‘orange brandy’ or ‘mandarin liqueur’ type bottles you find on supermarket shelves. It can also be made with peach schnapps. Melt the chocolate in a heat-proof bowl and pour out into a shallow dish. 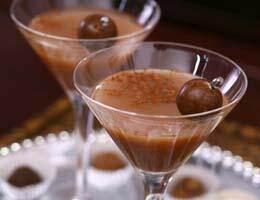 Dip the rim of your martini glasses, twisting sharply to stop the chocolate running down the glass and stand upright. Allow to set and then chill the glasses. Shake all other ingredients with ice in a cocktail shaker and strain into the prepared glasses. This deliciously decadent recipe can be made using a range of liqueurs from Baileys to Tia Maria, to any fruit-based liqueur, and you can vary the decoration that you use to match the nature of the liqueur that you’ve chosen. Heat oven to 180ºC or gas 4. Line the base of a 25cm spring-form tin with greaseproof paper. Melt the butter and blend with the biscuit crumbs before pressing into the base of the tin, bake for 10 minutes and set aside to cool. Increase the oven temperature to 240ºC or gas 9. Beat the cheese and sugar together until smooth and then beat in the flour, vanilla, the liqueur and the eggs beaten with the sour cream or crème fraiche. Use a little extra butter to grease the sides of the tin before pouring in the topping mixture and smoothing the top evenly with a spatula. Bake for ten minutes before lowering oven temperature to 110ºC or gas ¼ for a further 25 minutes. Turn off the oven, then open the door and leave the cheesecake to cool inside the oven for at least two hours. The top may crack a little but don’t worry about this. Two hours before serving, blend together the soured cream and liqueur of choice and smooth it over the top of the cheesecake and refrigerate. To serve, dust the top of the cheesecake with cocoa and then mark into eight or sixteen portions using a knife to indent the topping – decorate every other portion with a chocolate curl before carefully removing the cheesecake from the tin and placing it on a pretty serving plate.